Ten days since getting underway, the CONIFA World Football Cup has reached its final day. Conducted at a breathless pace, the tournament has been a joy to watch as teams representing 'nations, de-facto nations, regions, minority peoples and sports isolated territories' have put themselves firmly on the football map, certainly in the minds of all those watching. With an average of over four goals per game, a number penalties, red and green cards - entertainment has been in rich supply. There was drama too in the form of the Ellan Vannin/Barawa 'ineligible' player row which threatened to derail the tournament at the end of the group stage and the effects will still be felt on Saturday as the 15th/16th Placement Match has been turned into a dead rubber. The form book has also gone out the window with a number of shocks and upsets along the way. Neither the current leaders in the rankings nor the reigning world champions made it to the semi-finals and a team who filled in at short notice have gone all the way to the last two and could well win the whole thing. The fans of various nations have also made their mark on the tournament - be it the music and colourful clothing of Matabeleland and Tibet, the pyro of Szekely Land or simply the large numbers of vocal fans from Northern Cyprus and Abkhazia. If you haven't been to a game yet, Saturday is your last chance and Enfield is the place to be. If you want, you can get tickets to watch the Third Place Play-Off (3pm) and Grand Final (6pm) played back-to-back and then watch the Closing Ceremony afterwards. We should get the biggest crowd of the tournament by some distance and the atmosphere should be great. You can buy tickets in advance here or you can take a chance and pay on the gate. There is also a range of merchandise you can order online or buy at the stadium - CONIFA is a not-for-profit organisation run by volunteers, all purchases will make a difference. My tournament so far has seen me watch Northern Cyprus draw 2-2 with Abkhazia, Matabeleland beat Tuvalu 3-1 and on Thursday I went to the thrilling semi-final between Northern Cyprus and Padania where I took the photo above. I've got my ticket for the final and am genuinely rather excited. 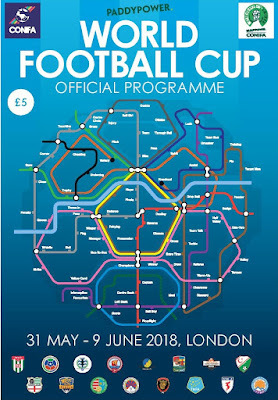 The buzz around the tournament has been great and I believe CONIFA are set to announce who will host next year's European Football Cup before the end of the tournament - the last I heard was that County of Nice and Nagorno-Karabakh were the two main contenders. Don't forget that individual membership of CONIFA is available to anyone for 25 euros giving you the chance to vote on all kinds of things at the AGM - I got mine a couple of months ago. There are eight matches in the tournament on Saturday with several grounds hosting two games so a double or triple, at a push, is possible. 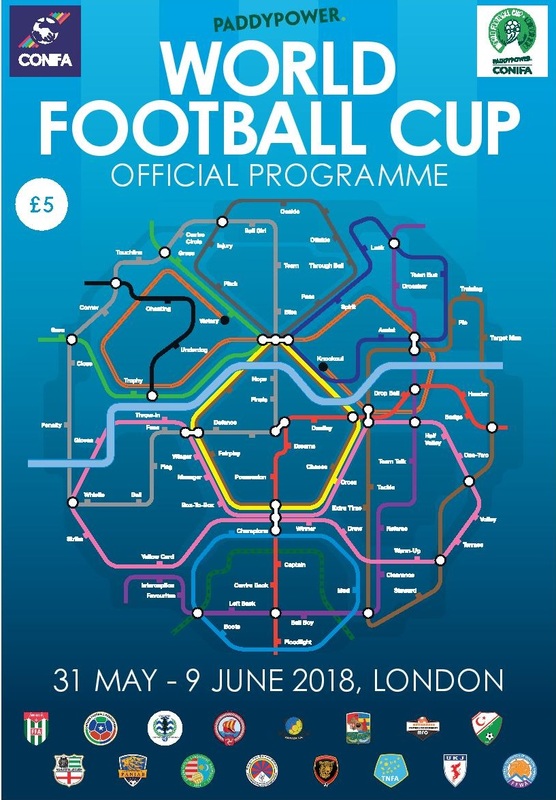 The only realistic possibility of this is if you shuttle between Fisher, Haringey and Enfield but a car or bike will be required to see all three games. Please note, that a significant part of the London Overground network is shut on Saturday making travel to games at Haringey and Enfield less straightforward than normal but more on that below. Details on all of this day's games can be found on the following match maps. If you've never used them before, please note that when there is more than one match at a specific ground you'll only be able to see individual match pins if you zoom right in. If you don't, the pins obscure each other and you might miss them. To avoid this, you can also scroll down the list of games on the drop down menu at the top of the map page to make sure you get all the information. If you've come late to this, you might not be aware that after the group stage no-one gets entirely eliminated. Those who finished in the top two in their groups move forward to the quarter-finals in the traditional sense while the remaining eight, rather than go home, move into a placement competition to see who finishes in 9th-16th. With the quarter-finals completed, all the losers from those games move into the placement competition for 5th-8th, while the losers of the first round of placement games move into a new contest for 13th-16th. After the semis, we get to see who will contest the third place play-off too. This guarantees that each team which makes the journey to London plays six games and gets their money's worth. Tickets are £12 adults, £6 U18s per game on the gate. Seeing two games at two different grounds is possible on Saturday with matches at taking place at 12pm, 3pm and 6pm. If you're prepared to shave off a few minutes at the end or start of a game, squeezing in a third could be done as well if you go to the 12pm game at Fisher, the 3pm one at Haringey and the final at Enfield at 6pm but you will need your own transport to have any chance. Please be aware that a large chunk of London Overground is shut on Saturday so there will be no train service to White Hart Lane, Southbury or Enfield Town. Therefore if you are travelling to the games at Haringey Borough or Enfield Town by train you are advised to catch a Piccadilly Line train to Wood Green for the former or a Great Northern service from Moorgate to Enfield Chase for the latter. 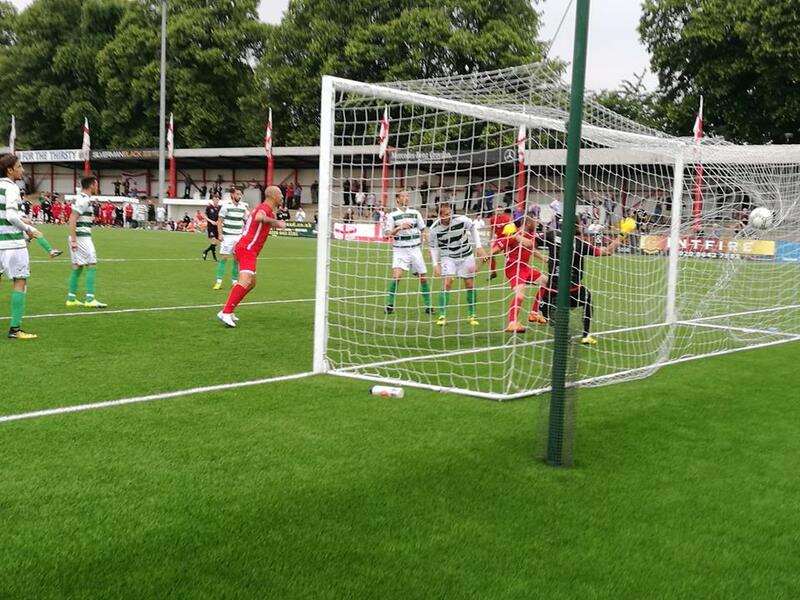 Karpatalya v Northern Cyprus @6pm - after 10 days of international competition, the CONIFA World Football Cup comes to an end with this intriguing contest at Enfield Town's Queen Elizabeth II Stadium. These two started the tournament by playing each other in Group B on the opening day. Karpatalya, made up of ethnic Hungarians based in Ukraine, came in as late replacements for Felvidek so not many knew what to expect of them. When they held one of the favourites to a 1-1 draw, people started to take notice. Two games later, they had won the group after beating reigning champions Abkhazia and Tibet. They notched up further victories over Cascadia and Szekely Land to make the final, meaning the only team they failed to beat were Northern Cyprus. Mustafa Boratas's side look the stronger on paper and are one of the big boys of CONIFA. Runners-up in last year's European Football Cup, they arrived in London at number three in the rankings. The draw against Karpatalya was followed up by a win over Tibet and another draw against Abkhazia. However, with this less than stunning group stage performance behind them they then thrashed Barawa 8-0 and came from behind to beat Padania, who looked like champions up until that point, 3-2 in the semi-finals. This game will undoubtedly be close again but that doesn't mean there won't be goals - this tournament has produced loads with 157 from 38 games (excluding the two friendlies following the exit of Ellan Vannin) which is an average of over four per match. With a large Turkish Cypriot community based in north London and all the other squads and many of their fans present for the Closing Ceremony after the game, there should be a very decent attendance and fantastic atmosphere. Don't miss out - book your ticket online now and print it out before you set off.